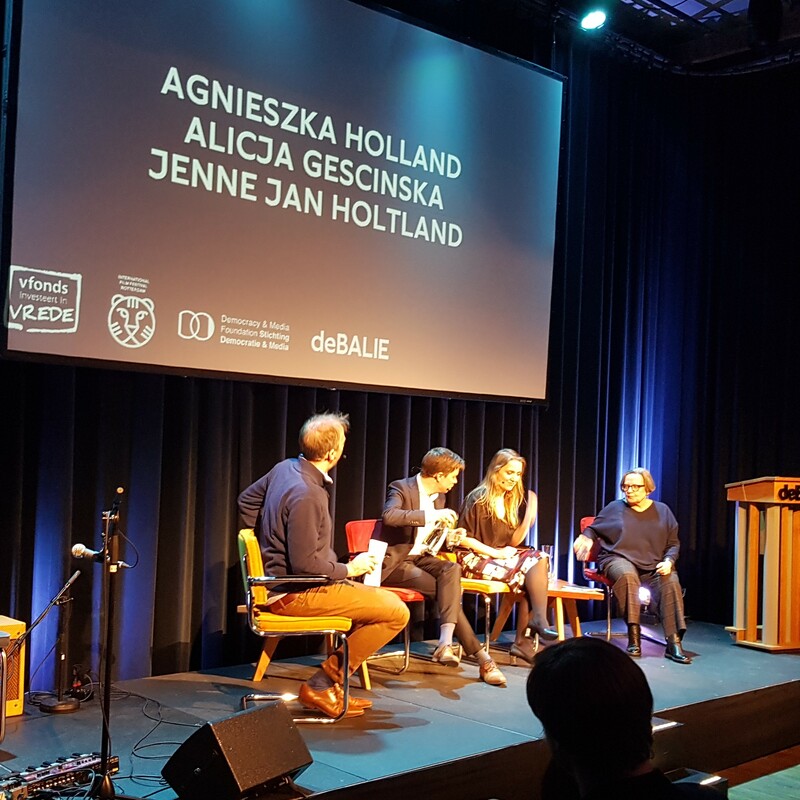 Op 26 en 27 januari sprak gaf Agnieszka Holland de vrijheidslezing in Rotterdam en Amsterdam. De lezing (integraal hieronder opgenomen) is een initiatief van debatcentrum De Balie en IFFR. Bij de lezing in Amsterdam was aansluitend een vraaggesprek met de mevrouw Holland door Eelco Bosch van Rosenthal. 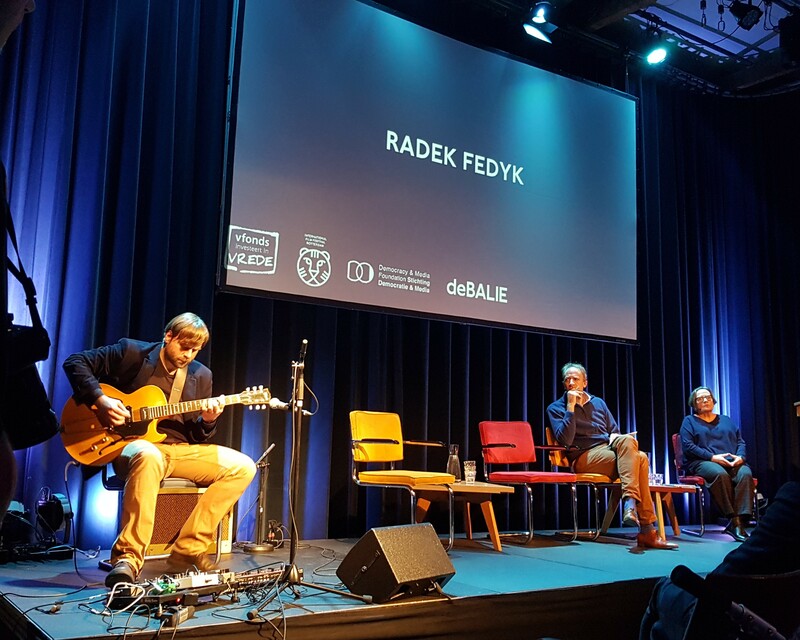 Na een muzikaal intermezzo door multi-instrumentalist Radek Fedyk (Radek op Facebook) volgde een paneldiscussie onder leiding van Eelco met Agnieszka, filosofe Alicja Gescinska en Jenne Jan Holtland. De lijn van de lezing is dat na de val van het communisme autoritaire of totalitaire regimes en oorlog verledentijd leken te zijn. Maar volgens Agnieszka Holland is de oorlog niet weg maar slechts slapende. Verder heeft het recente verleden laten zien, met opkomst van populistische presidenten, dat de werkelijkheid (Trump) de fictie uit de film (House of Cards) inhaalt. Gegeven de uitdaging waar de wereld voor staat met deze opkomst van het populisme en de problemen met het klimaat ligt er grote uitdaging voor de kunst en de kunstvorm film. Is het mogelijk om met nieuwe beelden in films opnieuw de werkelijkheid vorm te geven? Het kan bijna niet anders dan dat het panelgesprek ging over de situatie in Polen en met name de verdeeldheid die in de samenleving is ontstaan. Waar de hoop was dat de moord op de burgemeester Adamowicz van Gdańsk misschien kon leiden tot samenhorigheid lijkt het de maatschappij verder te verdelen. (Voor)oordelen over de ander liggen voor het oprapen. Wat volgens Gescinska eerst moet gebeuren is bij jezelf te rade gaan waar de haat/angst voor de ander vandaan komt voordat je de dialoog kan aangaan in een poging om tegenstellingen te overbruggen. Net als in de lezing ging het gesprek over vrijheden en zekerheden, Hoe lastig is het om daar een balans in te vinden en hoe kunnen kunstvormen zoals film en literatuur maar ook filosofie een leidende rol daarin spelen? Van film is het mooie dat dit, via het medium TV of video on demand (bijvoorbeeld Netflix) daadwerkelijk een groot publiek kan bereiken. Dit is met literatuur of filosofie lastiger is omdat dit vaak een geval is van 'preaching for the converted', zoals een mede-toehoorder het uitdrukte. Een belangrijke uitdaging daarbij is om beelden te vinden die beide doelgroepen aanspreken, niet te expliciet zijn zodat ze niet als propaganda voor de een of de ander kunnen worden gezien maar wel zo zijn dat het publiek ´between the lines´ de boodschap van de maker oppikt. Een passend einde van het debat, dat aansloot bij het slot van de lezing, was toen de regisseur in Agnieszka letterlijk opstond om de scene van de moord op Paweł Adamowicz uit te beelden als potentiële scene in een film. Zo zette ze onze verbeelding aan het werk. De lezing van Agnieszka Holland nemen we hier integraal op. Voor de (online)leesbaarheid hebben we alleen witregels en tussenkopjes ingevoerd. U kan er natuurlijk ook voor kiezen om de video van Balie TV te bekijken. When I decided that one day I will become a film director - and I was 15 at that time - film seemed to be living up to Lenin's famous definition as "the most important of the arts". It was the mid-sixties and European (and Asian) art-house cinema was at its peak. The artistic movement had in its ranks such incredible personalities as Bergman, Bresson, Resnais, Fellini, Antonioni, Rosselini, Passolini, Reed, Wajda, Kurosava, Ozu and many, many more. They were all bound by a single shared experience: all of them, as grown, mature people, lived through the horrible atrocities of World War II, even if for some of them the experience was not that immediate. During that time, humanity showed its most horrendous face and the Holocaust, the death camps seemed to mark the absolute heart of darkness, an end of the line, after which "poetry is impossible". The experience of this generation, of the generation of my parents, was a radical one. Many of them would also experience the war on their own: they lived with the constant feeling of danger; fear, suffering, they often had to make impossible moral choices. For all of them, the war had been an existential shock, which determined their perception of reality, their values, and their moral hierarchy. Now, this most certainly does not mean that all of them, or that even the majority of them would explicitly tackle the subject of war in their films. Nevertheless, it is clear to me that the experience of war provided them with a more profound, strident perspective and a certain personal gravitas; the feeling of responsibility for what kind of stories they tell and what formal choices they make, the awareness that the world is infinitely complicated, that people are capable of absolutely everything, even of the most atrocious acts and that our sense of security is extremely fragile. The experience of war required new stories and a new language, most of all, it gave the young filmmakers the power to speak with their own unique voices; their artistic sensitivity was nourished both by the reality around them and by introspection. They did not want to, nor they had to, hide behind conventions or traditional forms of expression. They knew that the audience, who shared their fears and doubts, would follow them even on a dark and bumpy road. Those were beautiful years for cinema, which seemed to be growing up, widening the scope of its formal means of expression. The next generation, that of people born shortly before the war, not only opened itself to new issues of modernity - related to culture, society or politics, but most of all, they introduced in the language a kind of anarchist boldness, which in various countries led to the revolution of 1968: student movements, the hippie culture, freedom initiatives in countries behind the Iron Curtain. There was a real wave of New Waves: the Czech one, the French one, the British one... Cinema started to use artistic styles which earlier had been present in poetry or visual arts, which at times led to cinema drifting towards everyday life, to a verismo-like realism, other times making the reality highly subjective or poeticised, introducing in it stylistic elements of surrealism, collage or abstraction, playing with space, trying to grasp the essence of the contemporary change. The war had ended thirty years before, the world was divided and the new generation wanted to radically break away from the stiff, conservative older generation. Godard's revolutionary approach seemed like the most accomplished manifestation of this new language. The cinema of the two generations that I talked about was coming to life in the period when I was starting to think about films from a different perspective than that of a spectator; but if I wanted to find my place in the world of cinema, I had to somehow artistically address the cinema of my predecessors, I had to draw my own map of human and artistic identity and fight for this personal map to find and maintain its place on a larger map of the Polish and world cinema. In Poland, my home country, a new group of filmmakers which concentrated around two of our older colleagues, Wajda and Zanussi, was founded in the 1970s. Life under real communism was threatening, but at the same time seemed somewhat familiar. Since the mid-fifties, the system had become less unmerciful and had ceased to be the cruel machinery led by Stalin. The people in power were cynical officials who mostly just cared for their own comfort. As it turned out, we learned to skilfully go around the system, widening our freedom zone. We learned to trick the censors, because we knew that we remained in a kind of beautiful synergy with our audience, who learned to read our messages between the lines and who proved to be extremely bright (which sadly is not the case nowadays) when it came to deciphering metaphors, allegories, symbols, pars pro toto and other elaborate stylistic figures. We wanted to tell stories about the contemporary world and voice our collective anger. In the summer of 1980, this anger met with the anger of workers from the Gdańsk Shipyard, whose strike led to the creation of the Solidarity movement. It was then that we, Polish filmmakers, felt an incredible sense of agency, which scared me, to be honest. Does this sort of unanimity, this kind of servitude towards the expectations of a social group not smell of conformism? Is this not a path that leads straight to spreading propaganda? The role of art is not to answer the society's current needs, it is to provoke discussions, to broaden horizons, to anticipate threats that had not yet come to life, but that pulsate somewhere deep below the surface of reality? Back then; we would still think that so much was in the hands of cinema. In the 70s and 80s, American filmmakers such as Coppola, Scorsese, Hal Ashby and many more would make gritty, socially engaged films, which at the same time were attractive to a wider audience. In Europe, there was a lot of high-quality mainstream movies, but ones that had been created with a bold vision, by incredibly creative personalities. In those films, complex and challenging issues were presented in a communicative way, which was attractive to a wide audience. While shooting my first movies, I was certain that my place would be close to this mainstream, although I would admire with a tad of jealousy, the dream-like, oneiric subjectivism of Tarkovsky or the formal experimenting of others, and later the radical brutality of Haneke. In the 90s, the world started to become more even, the Iron Curtain was gone, the Berlin Wall fell, Polish communists felt that they were helpless and decided to sit by the Round Table together with workers and dissidents, accidentally giving them all the power. The Soviet Union had fallen, burying - as we then thought, once for all - the temptations of totalitarian ideas and the illusion of a bright future of global communism, the idea of an imposed, universal happiness. Those ideas were so extremely compromised because of the enormity of the atrocities committed under the banner of real communism, so extremely false in true Orwellian style that no one would have thought they might one day be reborn. A return of fascist-like ideology seemed even more absurd. The vaccine of sorts, made of the Holocaust, the creation and development of the European Union were meant to guarantee a permanent immunity for this awful temptation. There seemed to be no other option than capitalism, liberal democracy, and free market. Some historians proclaimed "the end of history". Meanwhile, under the seemingly rational surface of reality, new challenges and fears were rising. The Soviet Union was terrible to its citizens and to the citizens of its satellite states, but its very existence added humanity to Western capitalism. When the Soviet Union fell, the ghost that would temper the unmerciful egoism of capitalism disappeared with it: the rich started to get rich faster, the poor were getting poorer, many people fell into the trap of mortgage. Consumption and new technologies became our favourite form of entertainment, a doorway to escape from the real world. Cinema became as boring as life in the axiological vacuum of neoliberalism. The majority of filmmakers did not have a significant human or historical experience to discuss, they were very apt, sometimes even innovative craftsmen or artists, but they lacked substance. The centre, the mainstream cinema started to shrink and cinema, much like music, divided itself into two opposing camps: sophisticated, ambitious and challenging art-house cinema and popular, artistically lukewarm entertainment, dominated by unambitious comedies or Hollywood super-hero flicks overflowing with special effects, family-friendly animations or romantic comedies. The producers focused on genres that are communicative everywhere and always attractive, but lack any specific cultural identity. The void left by high-quality mainstream cinema was filled with ambitiously conceived TV series. Nature abhors a vacuum; people are always hungry for gripping stories and fascinating characters. Currently, the TV series has become the most dynamic branch of audio-visual fiction storytelling, it is also the most popular one; it is benefitting from the revolutionary changes in the ways of distributing audio-visual content - cable, the internet, VOD and so on. There are more and more television series and they have started to conventionalise themselves after the first wave of innovative approach. Nowadays, only very few of them tackle the true challenges of our contemporary times, either topically or philosophically. I have started to feel more and more that the role of audio-visual narratives is to provide an escape from reality. 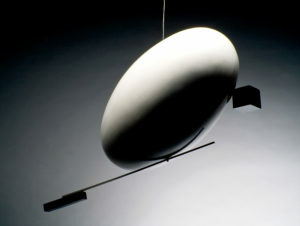 Art and entertainment - much like politics - started to become an escape from freedom. Being free means being responsible and who would have wanted to feel responsible for our contemporary world? What kind of duties this responsibility would mean for the filmmakers? Are they equipped to face the challenges of the real dangers and questions? Are they ready to leave their (our) comfort zone? I felt somehow different from my peers in the West, but even more different from younger generations of filmmakers; maybe because I have experienced history on a larger scale: I was born shortly after the war in a communist Poland, I grew up in the ruins of Warsaw, I wore the stigma of the trauma experienced by my Jewish father, a communist who in the beginning of war escaped to Soviet Russia and fought there, unaware of the fact that he lost his whole family in the Shoah (he never spoke about it). He believed in communism, in a future beaming with freedom, equality and a universal happiness for humanity. Instead, what he got was injustice, false accusations, corruption of the initial ideology, suffering and death for those who tried to fight for freedom and for those who never even knew what real freedom was. He came to realise that he was co-responsible for this terrible lie. When my father lost faith in the ideas that were the very purpose of his youth, he once again tried to start everything anew. Sadly, my father failed – in the age of 41, he was arrested by the communist Security Service officers, and after being harassed during the hearing, he committed suicide. I was 13 years old at that time and since then on, my father's last name (which, in his honour, I kept even after getting married) became a stigma in the communist Poland. When I was in film school, I experienced an outburst of hope and a carnival of freedom, as Milan Kundera would call it, during the Prague Spring. I have seen Soviet tanks on the streets of Prague in August of '68, the resistance of the society, which ended in the self-immolation of Jan Palach, followed by the spread of a collective conformism and resignation after being defeated by the brutal force, the social process of adaptation to the lie called "normalisation". All of this was the topic of the mini series "Burning Bush" that I would shoot for HBO 45 years later. It is a film that I am particularly proud of; because it really managed to show in an evocative way the mechanisms of cowardice and of courage in front of a seemingly benign, but in reality terribly suffocating, total oppression. I made three films with stories from the Holocaust, all of them were told from the perspective of regular people caught in the machinations of History and desperately trying to trick it. I also wrote several screenplays about this time. All in all, I spent over seven years with the Second World War on an intimate level - longer than the actual war had lasted. In my opinion, the war never actually ended - it went dormant, it hid below the surface and can awaken anytime in a new, but equally absurd and violent form. This is why I considered it my duty to evoke the war in my films. The present not only has its roots in the past, it coexists with it everyday. Here. Now. All the time. All it takes is for people to get overwhelmed with fear, which generates hatred. Surprisingly (or not surprisingly at all) our times have started to be penetrated by fear. Various dangerous factors of the contemporary world, to which no one except for populists seem to have a cure, have started to spread themselves: the drastic changes in our climate, a crisis of faith in the ideas of the liberal democracy and of human rights, a huge wave of globalisation, migrations, the concept of the cultural gender and the social and demographic changes it entails, an enormous internet revolution, which changed everything, starting with the circulation and verification of information, to the way we communicate and create relationships. We have found ourselves in a new, dangerous place - both as the human race and as a planet. During the upcoming decade, anything can happen, even the worse scenario. Sometimes, I think that we have found ourselves on the Titanic. However, from the filmmakers' point of view, the situation has its perks: it puts new challenges on our way. The troubled contemporary world forces us to step out of our comfort zone and to look at reality and at ourselves from a fresh perspective. The recent triumph of grotesque populists in the United States, in Brazil, in the Philippines (and of slightly less grotesque ones in Poland, Turkey or Hungary) has shown us that reality is stranger than fiction and that dystopias as presented in The Handmaid's Tale or in alternative versions of politics, like presented in House of Cards, are starting to look like reality shows. As the young Polish writer Łukasz Engelking writes: "The starting point for thinking about the triumph of populism in the recent years could be Michael Wolff's definition of Donald Trump as a real-life fictional character. Whomever he may be, this fictional character managed to win the support of very real people, making the world "out of joint", as the Hamlets of the liberal bubble would put it. What is more, during this process, the number of Trump supporters did not decrease at all." Masses in wealthier countries are looking for reassurance that this global crisis will not threaten their sense of security, nor interfere with their everyday life. They want to preserve their (apparent) autonomy. They are waiting for someone who would officially allow them to close themselves in egoistic bubbles and go on with their lives as if nothing had happened. So we, filmmakers, are standing in front of the question whether it is possible for us to have real impact on our world and how we go about making it happen. Since the characters we create have inhabited our reality, then maybe we should introduce reality to our films and put the world back on track by creating a new kind of characters. Responsibility today means putting our imagination to work.